What do you look for when you buy a perfume? Pleasant, sophisticated scents? A fragrance to match the season? Or a bottle that looks like it belongs on display at the Tate Modern? There’s no denying it, the perfume counter has become an art gallery. A place where each uniquely shaped bottle is displayed on top of a glittering glass plinth beneath perfectly positioned spot lighting. A place where you can’t buy 250ml of liquid for less than £30. The fact is – perfume isn’t about smell anymore. It’s about theatre, it’s about show – it’s about the 10 minute long feature-film starring Kiera Knightly and the bottle that contains more glass than liquid. With every A list and Z list celebrity and every fashion house launching its own signature scent, the competition seems to have developed into a game of who can produce the wackiest bottle. And designs are only going to get weirder as labels jostle and vie for our attention. So what’s on offer this summer in the way of peculiar packaging? 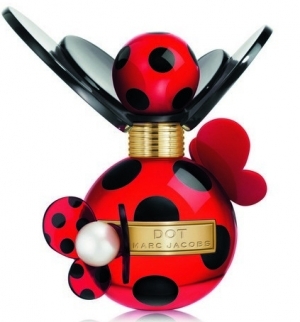 How about a perfume bottle inspired by a ladybird? Yes, the latest edition to Marc Jacobs’ perfume collection is a little red and black affair named ‘Dot’, designed to look like a ladybird nestling in a flower. Although the fragrance sounds delicious – berries, coconut water, jasmine, orange blossom and vanilla – the bottle looks like a night out with the TOWIE cast. All acrylic and no class. Dot is due to launch in the UK in July. Visit the Marc Jacobs site to learn more. This is by far the best idea for a novelty perfume bottle so far. Shaped to look like a grenade, this relatively bottle-shaped bottle has just the right amount of quirk to stand out from the shelf without looking ridiculous. The scent is reputed to be light and sweet with a ‘delicious floral addiction’. Buy Flowerbomb at boots for £55. Nina Ricci is all about cute and kitsch with a promiscuous edge. The new Nina Fantasy fragrance comes in a white porcelain bottle adorned with apples, butterflies… and a standing lamp. Certainly a little more expensive-looking than Marc Jacob’s ‘Dot’, but without the esteemed label and good publicity, this bottle could easily be straight out of the Hello Kitty merchandise catalogue. Head over to Nina Ricci for more info.